Sinan, a Turkish staff member in the admissions department, mentioned a few culture shocks since he moved to Europe. For instance, he recalls how impressed he was, that cars stop at a zebra crossing. He argues “In Turkey this is impossible, cars don’t stop for you and you have to be very careful when crossing the street." Through a video, students could experience the different ways of tackling zebra crossings. Sinan then explained how culture comes in every shape and form and can be seen in individual clothes, religion and food. Students were then asked about dinner times. Since most of the students were Dutch the answer was 6 or 5 PM, but when Sinan asked the Algerian and Malaysian staff members, the students were surprised that dinner would start at 8 or even 9 PM. 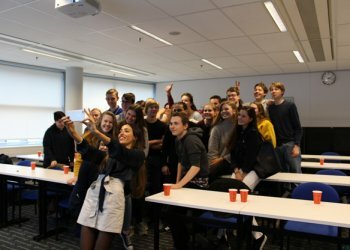 Dutch students were asked to explain the Dutch culture to the presenters - then there was silence in the room. What is culture and how do you define it? It is not easy to define one’s culture, since it usually involves routines that seem normal to the individual but could be interpreted as odd for an outsider. The group was curious about the facilitators' most irritating cultural experience in the Netherlands: “rain” and how often people speak about the weather. 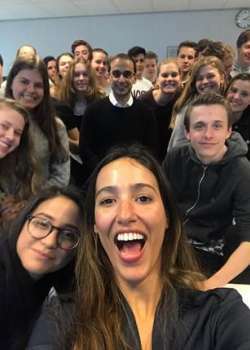 The students were intrigued by the stories the presenters shared and were very curious about cultural differences, especially that we have over 80 nationalities at Wittenborg - a truly global environment for the high-school pupils to learn from. 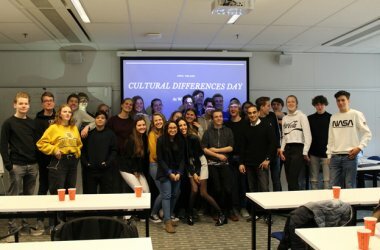 The KSG Apeldoorn Dutch students hardly needed to travel very far to learn about Malaysian, Algerian and Turkish culture combined in one session, just a short walk. Here at Wittenborg the global setting is truly amazing, where students learn how to approach cultural differences and avoid stereotypes.